Across Europe and the world, countries are attempting to develop their health and social policies and practices to address the global challenge of increasing demand and pressurized supply, created by ageing populations, emerging technologies and finite resources (financial and human). 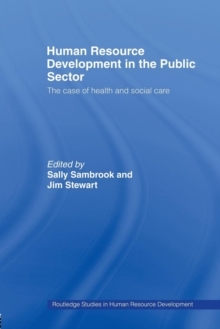 This text provides examples of attempts to develop HRD practices in health and social care contexts within France, Ireland, The Netherlands, Romania, Russia, the UK and the USA. Thus, the book is European and international in both scope and appeal.